As the first calendar month of Major League Baseball’s comes to a close, we’ve begun to accumulate enough data to make spring training projections look silly. While the NL Central has already begun to pan out the way most experts projected–the Cubs leading the way, the Cardinals and Pirates in contention, and the Reds and Brewers bringing up the rear–the reason for the Redbirds’ moderate success appears to be the polar opposite from projections made in March. The 2015 Cardinals allowed 525 runs all season, an average of about 3.24 runs allowed per game; the pitching staff’s ERA was 2.94 (478 earned runs allowed on the season), best in the majors by over a quarter of an earned run per 9 innings. Conventional logic dictated that, with Adam Wainwright, who lost most of last season due to injury, essentially replacing John Lackey, who departed for Chicago’s north side, and Mike Leake coming on board to fill in for the injured Lance Lynn, the Cardinals would still have the best starting rotation and one of the best overall staffs in the majors. Unfortunately, this year’s team has already allowed more runs (92) through 22 games than last year’s did (91) in its first thirty. The team’s two youngest starters–Carlos Martinez and Michael Wacha, both only 24–are a combined 6-1 with a 2.51 ERA. The perennially-injured Jaime Garcia also showed why the Cardinals picked up his option for this season in his one-hit shutout of the Brewers in his second start of the season; he has posted a decent 3.73 ERA thus far. Instead, it’s Wainwright and Leake, far and away the most experienced starters in the rotation, who have dragged the rotation down thus far. Waino’s 7.16 ERA is particularly disconcerting in light of the 1.44 he posted before tearing his left Achilles running out of the batter’s box last April. Continued improvement over with regular playing time for Randal Grichuk & Stephen Piscotty. Piscotty is hitting .297 (.305 last year) with 4 HRs; his OPS is up vs. 2015, as well. Grichuk’s average is down significantly (.189 vs. .276) and, as a result, his on-base and slugging percentages have suffered. A power surge for Matt Holliday, who only hit 4 HRs last season after playing in only 73 games due to two stints on the DL. Holliday has already gone deep three times this season, but his average is a little lower (.253 vs. .279) than last year. Ditto for Matt Adams, who mashed 17 HRs in under 300 ABs in 2013, then managed two fewer while exceeding 500 ABs in ’14; missed over 100 games last season due to injury. He’s been used off the bench for the most part this season, and has only hit .244 with 2 HRs and 17 strikeouts in 45 ABs. Better consistency from Matt Carpenter who, despite hitting 28 HRs and leading the league in doubles last season, went through a couple of slumps and power outages when shuffled around in the lineup. Marp’s average (.230) is well below that for his career (.286), but his on-base percentage would be a career high if today were October 2nd. While his slugging percentage is down versus 2015, his OPS is above his career average. While 2B Kolten Wong has essentially been a singles hitter thus far in his career, he has provided some offensive and defensive stability at a position which the franchise has had little for quite some time. Unfortunately, he’s yet to contribute any extra-base hits in 51 ABs this season, and his four errors are tied for fifth in the NL. Typically-excellent defense from Yadier Molina, and an uptick in batting average and, more importantly, power numbers. Sure enough, he’s been solid behind the plate thus far, and he’s hitting .341, albeit with 0 HRs. 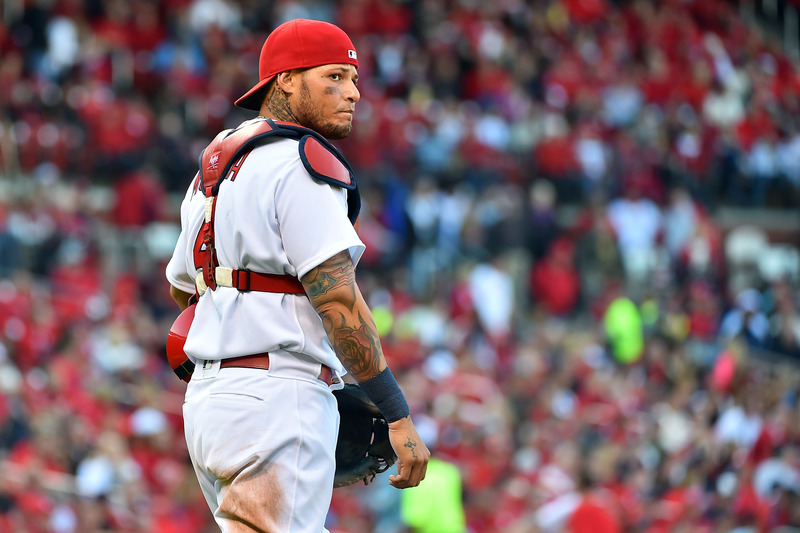 Still, Yadi’s on-base and slugging percentages, as well as OPS, are much improved over 2015. A little more rest throughout the season for Jhonny Peralta, whose average was above .300 at the end of April and May, and even as late as mid-July, but fell off to .275 by the season’s end. So, Peralta got hurt in spring training. The Cardinals signed Ruben Tejada, whom the Mets had just released, to fill in. Then he got hurt, so manager Mike Matheny was forced to turn to Aledmys Díaz, a Cuban defector signed by St. Louis in 2014. Through twenty games played, Díaz’ .423 average leads baseball by a wide margin. Tejada has since returned from the DL, which will be advantageous as Díaz has provided suspect defense at short, committing 5 errors already. Given Brandon Moss’ career numbers entering the season, a batting average above .250 is probably out of the question, so he was expected to provide some power off the bench or when filling in for Adams at first. Sure enough, he’s hitting .226 so far, but with 5 HRs in only 62 ABs, so he’s actually surpassed Adams a little in the pecking order; Adams is linked to trade rumors that have persisted since the offseason. Did I mention more power off the bench? Led by Tommy Pham, and the odd man out between Holliday, Adams, Piscotty, Grichuk, and Moss on a given day. So Pham got hurt in game #1… enter Jeremy Hazelbaker, who’s hit .317 with 5 HRs in 63 ABs in his first action in the majors. Overall, the offense has improved significantly. They are currently 2nd in the NL with a .275 average, have scored the most runs (135), and are behind only Colorado and Arizona in HRs. They’re currently on pace to mash 229 HRs, only twenty off the NL mark set by the Astros (including Jeff Bagwell and Ken Caminiti, and a nifty little short porch in LF in Enron Field’s inaugural season) in 2000. On April 27, they scored 10+ runs for the sixth time, a mark which wasn’t achieved until July 18 last season. What I do find troublesome is the offensive output in games against good teams. Don’t get me wrong, you’re generally going to score more runs against bad teams than against good ones, but this iteration of the Cards has been quite extreme. In 16 games against the Braves, Brewers, Reds, Padres, and Diamondbacks, they’ve pushed 124 runs across the plate, or 7.75 per game. They’re 11-5 against these teams with sub-.500 records. However, may recall the opening-series sweep in Pittsburgh, in which El Birdos scored precisely one run in two of the three games and seven total. Two weeks later, at home against the Cubs, they managed all of six runs in three games, with five coming in the third game to avoid the sweep. And now, having lost the first two (again, at home) in the current series against the Nationals, they’ve only managed five runs. So, in eight games against teams above .500, they’ve scored 18 runs, or 2.25 per game. That wouldn’t be enough even with last year’s pitching staff, so it’s no surprise the Redbirds are 1-7 against the Pirates, Cubs, and Nationals. Ultimately, while the pitching staff and defense do need to improve (for what it’s worth, they’ve allowed 4.5 runs per game against the three aforementioned postseason-bound clubs and 4.2 per against the five lesser teams they’ve faced thus far), the offense is only halfway to goal of improving. They’ve bailed out the pitching staff in several games, the reverse of the situation countless times last season. The 2016 lineup has proven it’s capable of hanging a crooked number against inferior pitching; now it must show it can manage to scratch runs across against the better pitching staffs the league has to offer. Here’s to hoping May and beyond offer a *little* better than .500 baseball.